Mark has done thousands of colleges. Mark developed his show touring exclusively in colleges for over 10 years. His show is the perfect event for a college crowd or can be tweaked for a mixed audience. Perfect for orientations, parents weekends, comedy nights, sibs weekends. Marks unique and hysterical show is guaranteed to kill. The 4D version requires special glasses. 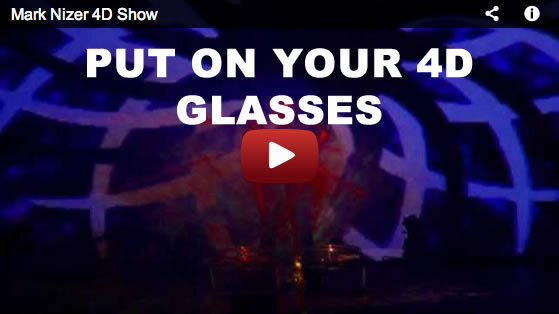 The show work's great either way, but the 4D option is an amazingly easy marketing tool, and adds A NEW DIMENSiON." Comedy Entertainer of the Year! Collegiate Entertainer of the Year! Mark has partnered with Siri Nizer (of iPhone fame) who is his virtual assistant. With Siri in the cast we can run the entire show without additional crew. Mark can bring all lights, sound and video equipment with him, or, plug into your basic light plot, sound system and projector, and give your crew the night off. This allows the show to have thousands of light cues, show automation and effects that would never be possible before. 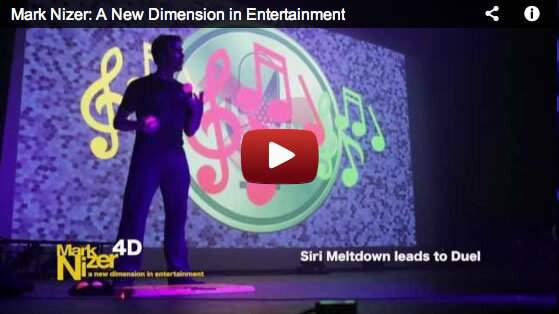 Mark Nizer - A New Dimension in Entertainment, truly is the FIRST one man show." "Mark Nizer is the genuine thing. More than an incredible juggler, he is a talented entertainer who can take any situation and run with it...an exceptional blend of comedy and the art of juggling." The show was great Friday! Thanks for doing such a superb job. I plan to speak with our performing arts staff about bringing you in again next year." A space with a 12' ceiling or higher. Blackout capability is nice for the lazers and other special effects but not required. Mark can bring everything including lights, sound and video if needed. A light colored wall, movie screen or cyc is helpful to project video to. In a typical set up, Mark plugs into your lights and sound system with his laptop and runs everything remotely from stage. Complete Tech information is available here. West Virginia Institute of Tech.